Solid phase extraction is an effective technique for cleaning up and concentrating samples, prior to HPLC or GC analysis. The technique offers targeted selectivity for analytes of interest, versatility for a wide range of sample volumes, can be easily automated for high-throughput, and is performed by following quick and simple methods ( load, wash, elute). Proteins in biological sample matrices have a dramatic effect in HPLC/UHPLC column lifetime and can interfere with MS detector sensitivity. Protein precipitation is a simple sample preparation technique that is used to remove proteins from the sample using an organic solvent or a salt. Although there are several methods for precipitating proteins from plasma and tissue, very few offer reproducible and effective removal of proteins from sample without excessive sample transfer, which can result in loss of recovery of the target analyte. The ideal protein precipitation method allows for consistent protein removal with as few sample transfers as possible. Find out what sample preparation technique is best for you by viewing our webinar. Phospholipids have been shown to reduce HPLC/UHPLC column lifetime and sensitivity and are also responsible for ion suppression. Phospholipids are present in a majority of bioanalytical samples including whole blood and plasma. 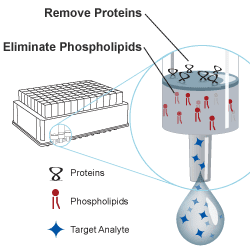 With an increasing number of clinical applications being developed from bioanalytical samples, the removal of phospholipids from the sample prior to LC/MS/MS analysis has become an important step for accurate analysis. View our short video demonstration of the many improvements you can make to your LC/MS/MS analysis by using Phree. QuEChERS (an acronym for Quick, Easy, Cheap, Effective, Rugged, and Safe) is a commonly used sample preparation technique that is employed in most multi-residue pesticide testing laboratories.In residue testing, the primary challenge is to eliminate naturally occurring pigments, fats, waxes, and other unwanted interferences from the sample matrix in order to achieve lower limits of detection and quantification of pesticides. Traditional techniques using liquid/liquid extraction employed the use of hazardous solvents, and suffer from poor recoveries for polar pesticides. The QuEChERS method has proved to be extremely versatile for simultaneous analysis of multiple classes of pesticides from various matrices. The large variety of food matrices, ranging from aqueous, fiber rich, to fat/oil based foods can undergo a relatively simple cleanup using different sorbent mixtures and a single technique. Our Vial Finder Selection web tool allows you to find the appropriate syringe filter to help you successfully remove particulates from your sample matrix in three easy steps. In HPLC, particulates and microbial growth in mobile phase buffers and samples can damage expensive HPLC equipment such as pumps, valves, columns and detectors. They can also lead to erratic analytical results. Pre-filtering samples and mobile phases prior to analysis can help prevent column and frit blockage, abnormally high operating pressures, and can undue wear on valve and injector seals. Syringe filters are commonly used to pre-filter samples with volumes ranging from 1-100 mL because they can easily attach to any syringe. The sample is pushed through the syringe filter membrane which traps particulates, resulting in a contaminant and particulate free sample. Novum SLE will simplify your liquid extractions. A simple, automatable cleanup method is developed for the analysis of acrylamide from coffee, yielding absolute recoveries that exceed 92% when analyzed by LC/MS/MS. Redefine your clean up with two unique types of SLE: Novum, a unique synthetic sorbent that provides consistent results from lot-to-lot and Strata DE, a cost effective alternative that replaces traditional SLE sorbents..
Stop shaking solvents and stop relying on dinosaurs to do you lab work. Simplify your liquid extractions with Novum SLE. Utilizing a single manifold, 96-well plates, 1 mL, 3 mL, and 6 mL tubes can be used with a simple adaptor kit. View the warranty for Presston 100 here. Learn about the newest way to increase productivity when processing sample preparation products.